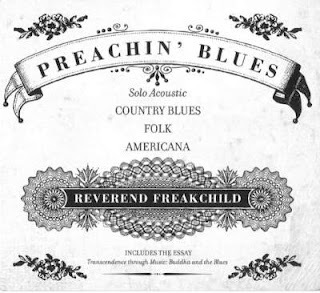 I just had the opportunity to review the most recent release, Preachin' Blues, from Reverend Freakchild and he shows his knowledge of country style blues. 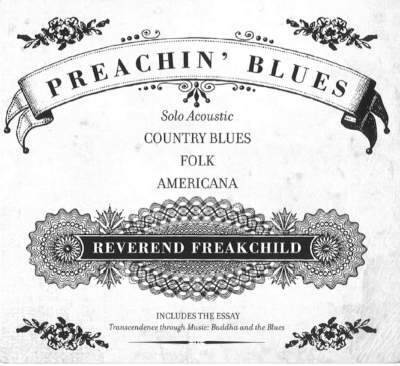 Opening with Breathing Blues an instrumental track, the Rev accompanies his harp playing with resonator. Cool. Blind Lemon Jefferson's See That My Grave Is Kept Clean has a rowdy, hooping singing style with pure resonator rhythm and harmonica. Nice job. In My Time Of Dyin' gets an upbeat rocking kind of feel with loose harmonica ride over nice acoustic resonator picking. Son House's Preachin' Blues keeps a lot of House's original arrangement with a more modern attack on slide resonator. Son House is one of my favorite players and I think that the Rev has paid a nice tribute here. All I Got Is Now maintains it's clever hook and with a rock rhythm on guitar, the Rev brings his own personal blues styling. I Wish I Was In Heaven Sitting Down maintains original arrangement and is detailed nicely by The Rev. Nice slide and nice vocals. Rev Gary Davis' It's Gonna Be Alright has a softer, more contemporary feel with resonator and harp accompaniment. Wrapping the release is Son House's Grinnin' In Your Face, another of my favorites. The Rev performs this totally acapella to the handclaps of the audience. This is a cool release, low key and natural.